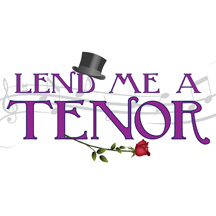 Winner of 3 Tony Awards and 4 Drama Desk Awards, Lend Me A Tenor is set in September 1934. The great tenor Tito Morelli, a.k.a. Il Stupendo, is scheduled for a one night only engagement. When a mishap puts the star out of commission, the theatre manager puts his assistant on the stage in his place. What follows is a night of mistaken identity and hilarious chaos. A sensation on Broadway and in London's West End, this madcap, screwball comedy is guaranteed to leave audiences teary-eyed with laughter. MIKE BOLAND* (Saunders) Playhouse on Park debut. Broadway: Ensemble (AN ENEMY OF THE PEOPLE); National tours: Juror 1, 10 (TWELVE ANGRY MEN), Schrank/Krupke (WEST SIDE STORY). Off-Broadway: Ritter/Billy/Monty (ORPHANS HOME CYCLE); Hartford Stage: Bob Ewell (TO KILL A MOCKINGBIRD), Ritter/Billy/Monty (ORPHANS HOME CYCLE); Theaterworks: Ensemble (EXONERATED); Long Wharf: (SHE STOOPS TO CONQUER, WIT, MYSTERY SCHOOL, A QUESTION OF MERCY); many others. Television: PERSON OF INTEREST, ZERO HOUR, RUBICON. Film: BOBBY DOGS. Won company Drama Desk Award for Orphans Home Cycle. CORRADO ALICATA (Bellhop) Playhouse on Park Debut! Spirit of Broadway Theatre: Benedict Arnold (BENEDICT ARNOLD THE MUSICAL), Hunter ([TITLE OF SHOW]), Uncle Henrik (NUMBER THE STARS THE MUSICAL), David (THE BOY IN THE BATHROOM). Wills Productions: Dr. Nilch (THE ADVENTURES OF SUPERBUNNY). Post Playhouse: Buffalo Bill (ANNIE GET YOUR GUN), Feldzieg (THE DROWSY CHAPERONE). Corrado would like to thank his friends and family for all of his support, and the Playhouse family for welcoming him in. JEFF GONZALEZ (Max) Playhouse on Park Debut! Shakespeare Theatre of New Jersey: Joe/Si Crowell (OUR TOWN). STNJ Touring Co: Figaro (THE MARRIAGE OF FIGARO), Cleomenes (THE WINTER'S TALE). Hudson Valley Shakespeare Festival: Diana/Lord Dumaine (ALL'S WELL THAT ENDS WELL), Gentleman (KING LEAR). Jeff holds an MFA in Acting from the New School for Drama. DONNA SCHILKE (Julia) Playhouse on Park: Edith, etc. (CHARLOTTE'S WEB) Winnipesaukee Playhouse: Dotty/Mrs. Clackett (NOISES 0FF); Madge Larabee (SHERLOCK HOLMES: THE FINAL ADVENTURE); Mrs. Banks (BAREFOOT IN THE PARK); Mrs. Baker (BUTTERFLIES ARE FREE). Sight & Sound Theatre: Savtah Devorah (JONAH). Ivoryton Playhouse: Margaret Lord (THE PHILADELPHIA STORY); Wife (THE KING AND I). National Tour; world premiere Warner Theatre: Lady Randall; Sir William (MAGIC TREEHOUSE: THE MUSICAL). Seven Angels Theatre: Chastity (ANYTHING GOES). Yorktown Stage: Aunt Em (THE WIZARD OF OZ). River Rep @ Ivoryton Playhouse: Ensemble (THE MYSTERY OF EDWIN DROOD). East Haddam Stage Co.: Various (PLAYS AND POETRY). KATIE VINCENT (Diana) is thrilled to be making her Playhouse on Park debut with LEND ME A TENOR. It has been a truly special experience to be onstage with such talented artists. Other theatre credits of note include QPAC's: NYC'S RISING STARS, SUNDAY ON THE ROCKS, and TIME OF YOUR LIFE. TV and Film credits include (but are not limited to!) "Frenemies" (Discovery ID), "BadPuss: A Popumentary" (Emily Weist), "Over Dinner" (Reza Hasan), "Dunes" (Shauna Sigglekow), "Out Of Body" (Josh Depew), and "For 20" (Blaze Mazur). Katie has a BFA in drama from NYU's Tisch. Keep up on Katie's career at www.katievincent.com. Ciao! JERRY WINTERS (Director) co-directed the world premiere workshop production of TWAIN'S LAST CHAPTER, by Brad Korbesmeyer at the Mark Twain House in Hartford, CT. Several of his other directing credits include: I LOVE YOU YOU'RE PERFECT NOW CHANGE and YOU CAN'T TAKE IT WITH YOU for The Lillian Russell Theatre in Iowa, where he also served as the Associate Artistic Director; A MIDSUMMER NIGHT'S DREAM at The Texas Repertory Theatre in Houston; and a staged reading of FORCES OF NATURE for the University of Connecticut. In November, he directed an acclaimed production of THE SKIN OF OUR TEETH at Eastern Connecticut State University. The production was held for competition by the prestigious Kennedy Center American College Theatre Festival. He has also directed ON THE RAZZLE (held by the Kennedy Center American College Theatre Festival) and AS YOU LIKE IT at Eastern Connecticut State University where he has served as an adjunct professor of acting and directing since 2007. Jerry has directed several new play readings for Hartford Stage's Write On playwright's festival and has served as an assistant director for the distinguished Humana Festival of New American Plays at Actors Theatre of Louisville. He holds his MFA in directing from The University of South Carolina.